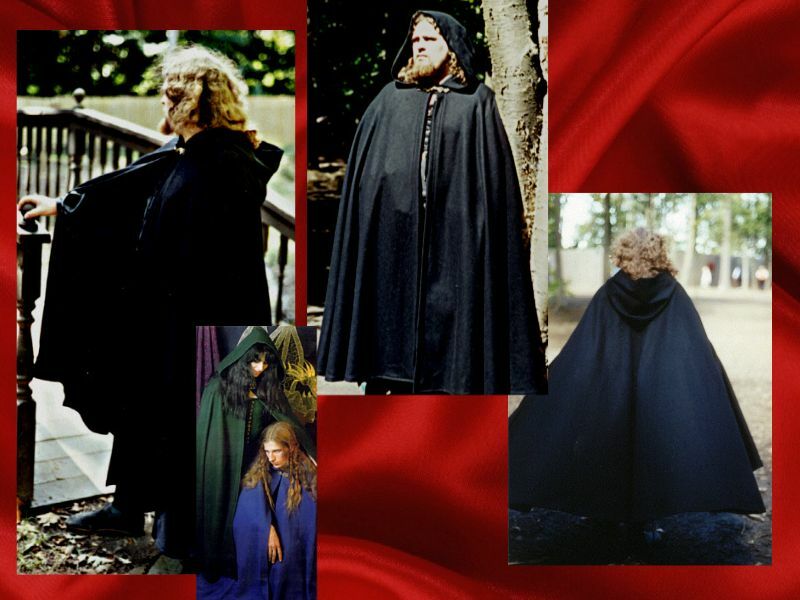 These capes come in either heavy cotton twill or thick, coat weight felted wool, called "Melton". Various colors are available at different times, so please call or Email us for current color choices. Black is usually available, however we can get other colors in at times. All of the seams are finished, with extra strength added to the neck. Made with durability in mind, these capes are then hand finished for that extra finesse our garments are famous for. Our Classic Capes each include a Norwegian Pewter Clasp as standard or a Large Scroll at $12; or double hook Pewter Clasp, orBronze at $25 in addition to the basic cost. Our standard clasps are always sturdier and larger than our competition for the same style of cape, therefore you don't have to worry about them breaking as long as care is taken not to step on or bend them too many times. Of course the bronze ones will never break, and they are attached to our capes with cloth for added strength. The Bronze ones are not available for the Cotton Style Capes. These clasps are much too heavy for the cloth. # C-4 100% Heavy Coat Weight Wool - $175. Wayfarer's Cloak: Easy going dramatic flair for men and women! 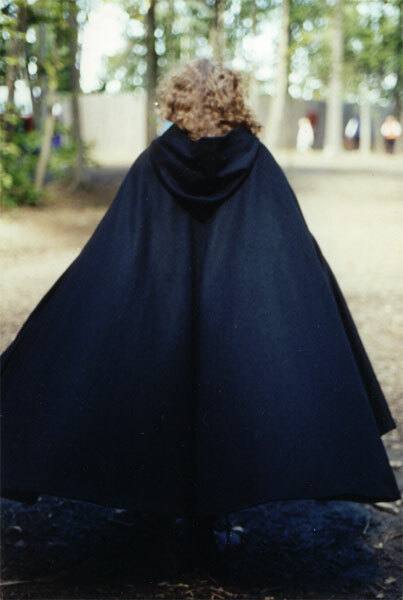 This Cloak is wonderful to wear anywhere; SCA, Renaissance Festivals, or to the grocery store. It is as easy to wear while wielding a sword or driving a car. The design makes it dramatic, warm and a delight to wear since your arms are able to move about with freedom. 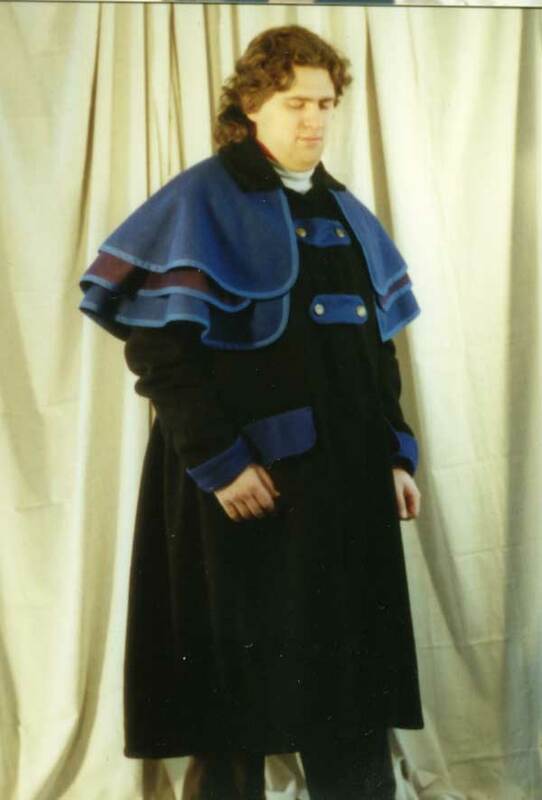 It is a rectangular cape, with an over cape plus hood and all layers are 100% Melton Wool with contrasting cotton or cotton/poly edging, finished with beads. All of our Wayfarer's Cloak come with a clasp, either Norwegian Pewter (very strong ones) or in Bronze designed by David Clark. We offer these Cloaks in an assortment of colored Wools, most of the time with the under cape being in black Or... the Wayfarer done entirely in black wool with the edging in one of the colors of our stock cotton/poly edging. This were difficult to keep in stock, especially the ones edged in either Purple or Red. Very Classy! Hidden pockets are an option, they become part of the fancy trim work on the front of the Wayfarer's Cloak. Wool Coachman's Coat: Easy going dramatic flair for men and even women who are daring enough! This Romantic Coat is wonderfully warm and fun to wear; SCA, Renaissance Festivals, or Downtown Anywhere. Can be done in solid black or Multiple colors as shown. Norwegian Pewter Clasps: Our durable Norwegian Pewter Clasps are always sturdier and larger than our competition for the same style of garment, therefore you don't have to worry about them breaking as long as care is taken not to step on them or bend them too many times. We also offer a Large Scroll Clasp for an additional $12 of the cape or cloak's price, and a double hook pewter clasp for an additional $25. Bronze Clasps: Strong, attached with fabric, wool, and sometimes leather. These Clasps are designed by David Clark, a fellow artist from the Ontario Renaissance Festival, and they never will break!!! After all, cannons were made out of this metal and held up very well. The bronze ones also do not tarnish as brass clasps would. The bronze clasps are an extra $25 added to the price of our garments, however, they are wonderful and worth far more. Sorry, but prices are subject to change without notice. Please call if concerned, however, we do try our best to stay consistent and competitive!